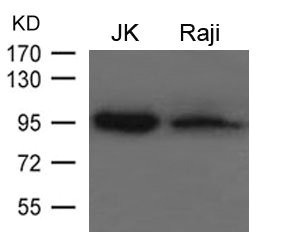 Western blot analysis of extracts from JK and Raji cells using PRDM1 Polyclonal Antibody. PRDM1 is the human homologue to Blimp-1, a transcriptional repressor affecting multiple key target genes for the terminal differentiation of B-cells along the plasma cell lineage. PRDM1 recruits methyltransferases to their targets, inducing methylation and thus transcriptional repression of those gene targets. Also, the PRDM1 protein binds specifically to the positive regulatory domain I element (PRDI) of the beta-IFN gene promoter. It was also recently demonstrated that PRDM1 plays a tumor suppressor role in diffuse large B- cell lymphomas. PRDM1 Polyclonal Antibody. Unconjugated. Raised in: Rabbit. Liquid. PBS with 0.02% sodium azide, 50% glycerol, pH7.3.